Wow, what a beautiful book. Oh and the story ain't so bad too. I must admit that this is one of the hidden gems of the New 52. All eleven issues of the new Supergirl series have just so much fun to read. This takes the Supergirl we all know and kind of love and turns it on it ear. Kara is really an outsider in the fact that she has landed on earth and has had only one run in with her cousin. I also like the how this comic is set in New York City. I wonder when Kara will run into the Fantastic Four. What's even better is that in the New 52 Supergirl's best friend is what was once her worst(and like only) enemy Silver Banshee. Seems like being Silver Banshee is a curse now, but it's doesn't make you all bitchy like it did in the old 52. In this issue Supergirl and Silver Banshee's brother Tom go on a date. Which is a nice change of pace from most modern comics. It's pretty interesting to see Kara and Tom on the date and Kara has no idea of the customs we use here on earth. While they are sitting in a pizzeria Kara gets hungry and totally take some pizza right out of the waiters hands for her and Tom. But just like all modern comics, a simple date gets turned into a slug fest. Heh, nobody seems to use that one anymore. Anyway a dude wearing a suit man of living nanobots shows up to do battle with Supergirl. This villains name is Swarm and he's trying to take out Supergirl for his boss. He never says who his boss it but I'm pretty sure it's the jerk from the first issue who tried to kidnap Kara. 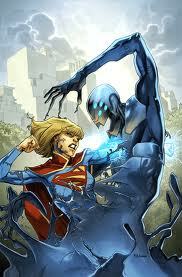 Supergirl is able to beat Swarm when she focuses her heat vision into his skull and knock him out cold. At the end Kara feels like she is endangering the only people she cares about and deiced to separate away them. You know, to keep them safe. Like that'll really work. I love how Mahmud Asrar draws Supergirl. I feel like he gets it. He understands that she is a teenager and not some top heavy hoe. He has a very clean line and i feel like this is a Supergirl that just about anybody can enjoy, she's attractive without being over the top.And yes we still don't like the non knee boots. So in closing Supergirl is a wonderful marriage of art and story.